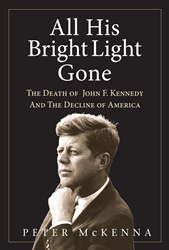 All His Bright Light Gone: The Death of John F. Kennedy and The Decline of America goes far beyond any other book about Kennedy. It says he left behind a priceless gift: A model for the way the United States must be governed if it is to succeed. The United States has become a nation the Founding Fathers would look upon with scorn. For decades, Congress has been unable to resolve, or even objectively discuss, the issues that determine the quality of life in America. Nothing is done about gun control, climate change, campaign finance reform, or many other important problems. Meanwhile, an absurdly small number of people have been allowed to dominate the creation of wealth. And this year the country may well turn to a man like Donald Trump for solutions to these problems. What went wrong? According to this new book by Peter McKenna, the death of John Kennedy in 1963 had a far more damaging impact on the country than is commonly realized. Kennedy spent years studying history, government, and foreign affairs, the very issues a good president should master. He knew that the United States began as a democratic republic, the most enlightened form of government ever devised by man. He also knew that this form of government is fragile, it works only when the people trust their government and participate in its affairs. Thus, Kennedy set out to create a modern-day republic, using his remarkable ability to inspire the average person. He made us proud of this country. He told the American people that politics is a noble profession and urged them to embrace their civic responsibilities. Under Kennedy, the people became a quasi arm of government and the republic flourished. This was Kennedy's genius. This is why his short time in office is called "Camelot." Subsequent presidents, however, reversed Kennedy’s approach, with disastrous results for the nation. Ronald Reagan, for example, promoted an ideology that said government is the enemy of the people and that the private sector should be the dominant force in America. His anti-government policies and "trickle-down" theory of economics gave license to unprincipled political leaders who allowed corporate interests to become more important than the interests of the people. Gradually, they turned this republic into a plutocracy that nearly collapsed during the economic crisis of 2008. This is the second book from veteran journalist Peter McKenna. He is a graduate of Columbia University School of Journalism and has written for the New York Times and other major publications. He spent the past five years researching the ways this country changed after Kennedy's death.